Harvey Gulf International Marine (HGIM) announced it has received both ABS (American Bureau of Shipping) class functional approval and USCG (United States Coast Guard) design bases approval on a 4,000 cubic meter LNG articulating tug barge (ATB) construction drawing package; the design accounts for ship-to-ship transfer and shore side resupply transfers. 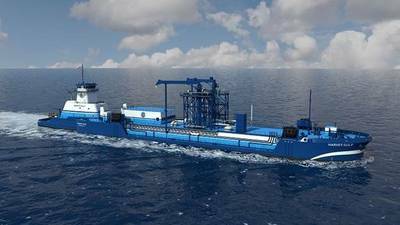 Working closely with its design partner Waller Marine, and in conjunction with ABS and USCG HGIM has developed the design package ahead of construction thereby minimizing the potential for delays and significant cost impacts to the project during construction. “The development of this vessel design highlights our commitment to and involvement in the strengthening of the domestic LNG marine fuel market, and our continued commitment to a leadership role in developing a robust supply infrastructure,” said HGIM Chairman and CEO, Shane J. Guidry. Harvey Gulf’s involvement in the U.S. domestic marine LNG market been highlighted by delivering the first U.S. vessel to use LNG as a marine fuel, Harvey Energy, and the development and operation of the first LNG Marine Refueling Terminal in the U.S. at Port Fourchon, La. The ATB has an approved design basis and it’s design meets all domestic and International requirement of a gas carrier, including the existing regulatory requirements defined in 46 CFR Subchapter D, 46 CFR Subchapter 0, the International Code for the Design and Construction of Ships Carrying Liquefied Gases in Bulk, 2016 edition (IGC Code), and applicable American Bureau of Shipping (ABS) Steel Barge Rules: Part 5 Chapter 2 Section 5 Liquefied Gas Tank Barges (as modified per 2016 IGC Code), and ABS Steel Vessel Rules Part 5C Chapter 8 Sections 1-19 (as modified per 2016 IGC Code and referenced within the ABS Barge Rules). The design team through its diligence has put together a vessel that has four independent 999 cubic meter type “C” cargo tanks, the ability to load and discharge at a rate of 600 cubic meters per hour and transit speed in excess of 10 knots. The design incorporates a robust fire and safety system concept for both components of the ATB and the independent ability of the vessels to manage situations as they arise. Working together with Wärtsilä, the cargo systems integrator on the complete design, supply, and integration onboard the vessel, assures both functionality and confidence in the operability of the system. Another key design component of the design is the use of a sub-cooler for boil off gas (BOG) management, the teamwork in conjunction with Air Liquide using their Turbo-Brayton Technology (TB 350) as a means to condition the cargo as necessary to manage BOG.